It was a special birthday – mine – and I thought it merited a special celebration. Instead of a blow-out party that we’d forget in a month, I decided to take my son, his wife and my two granddaughters (ages 11 and 14) on a trip we’d all remember — a special family vacation. The first challenge was choosing the right trip. That started the process of elimination. I decided not to repeat our vacation of a few summers ago when I’d rented a house in the French Alps for the gang. Even though it was lovely, it lacked a true vacation quotient for me. Just keeping up with the grocery shopping, cleaning, laundry, and cooking, not to mention driving from one place or activity to another, made me a prime candidate for a post-vacation. The idea of a land tour didn’t feel right; packing and unpacking, piling into a car or bus every day or two… well, that’s exhausting, too. Checking into a hotel somewhere was an option, but that lacked the pizzazz of education or adventure. As a travel junkie, my mantra is that travel is the greatest inheritance you can give offspring. And, part of it was selfish. I wanted to share exploring new places. After a lot of back and forths, I decided on a river cruise, not an ocean cruise. That’s when the fun and the laundry list of musts began. 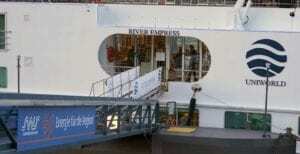 The ship should have fewer than 200 passengers and be family friendly. There had to be activities that catered to all ages and, yes, they had to be educational. Even though I want to go almost anywhere anytime, the idea of subjecting the girls to a “seniors” cruise sounded like a recipe for boredom. Initially, the consensus was a trip to Alaska. However, after pricing out excursions on small boats that could land near the shore, the trip was more than I budgeted. And to be honest, these boats were a bit primitive and careening around in Zodiacs and long hikes aren’t my thing. I wanted to be spoiled and was old enough to admit it: this was not a you’re-old-enough-to drink-legally birthday, after all. I wanted the cruise to be all-inclusive because I didn’t feel like shelling out for every drink or excursion. I learned that the hard way many years ago when each add-on shore outing cost more than the day on the water. After surfing the Internet and consulting cruise newsletters, a friend recommended I call cruise specialist, Carol Howell of Avoya Travel. Thank goodness I did, since it removed more than a modicum of indecision. Carol was patient as I explained what I wanted. After many conversations, she steered me to Uniworld’s Boutique River Collection multi-generation cruises. We chose “Castles along the Rhine” because castles sounded so romantic and it was an opportunity for the girls to be exposed to some German and French history. Confession – since I lived in Paris and Provence for more than 25 years, I wanted to explore a new destination, or I might have chosen France. 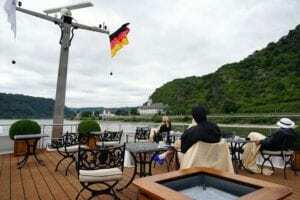 The two 2017 multi-generational Rhine river cruises began in Basel and ended in Amsterdam or vice versa. The ships stopped each day where we’d disembark and tour with local guides, all of whom were excellent. I liked it that the groups included fewer than 20 people so we could ask questions rather than feeling as if we were being herded. Because we moored at town docks, passengers could return to the ship for lunch, or stay in town and explore. There were tours after lunch or passengers could veg out and even have a massage. I really appreciated that days could be structured with activities… or not. When we were cruising, people would gravitate to the lounge or to the upper deck, where it was wonderful to share the views of the landscapes and castles. The sunsets were especially magnificent. Drinks, with and without alcohol, were passed around by staff members who couldn’t have been more accommodating. A lot of hot chocolate was consumed… wonderful and mellow times. Parents didn’t have to accompany teenage children. Some did, because the excursion was being led by incredibly fit members of the ship’s crew, who knew the passengers within hours of embarkation. So, while the girls were climbing, my son, daughter-in-law and I went to sample kinds of vinegar at the Doktorenhof Estate. We went by bus and the guide gave us the history of the area. After the tour, I took a cooking class with master chef Matthias Mangold. A couple of the teenage passengers cooked with us and one of the boys turned out to be an expert chopper. His parents were sufficiently impressed that I got the feeling they were going to turn over their kitchen to him when they returned home. Each day there were four land trips from which to choose. Our gang did many of them together, but I split and hit the wine tasting excursion instead of the active walking tour. We toured cathedrals, museums, small towns, and big cities mostly together and left it to the kids to ask the most intelligent questions. 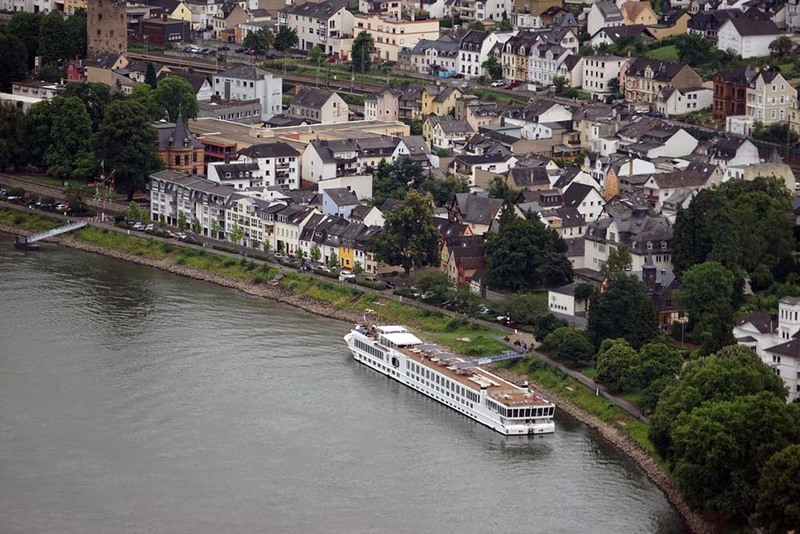 We boarded the ship in Basel, having flown to Europe a couple of days prior to the start date to overcome jet lag. We registered and went to our beautifully appointed cabins with really comfortable beds and first-rate linens. 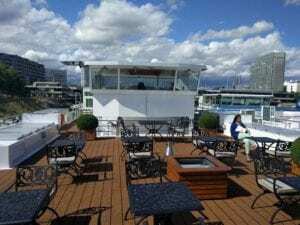 There was plenty of closet space for a week’s cruise, and the girls loved that their marble shower had large jars of L’Occitane soaps and skin products. We took an informal tour of the ship and were delighted to find a huge chess board on the top deck with 3-foot-tall chess pieces. 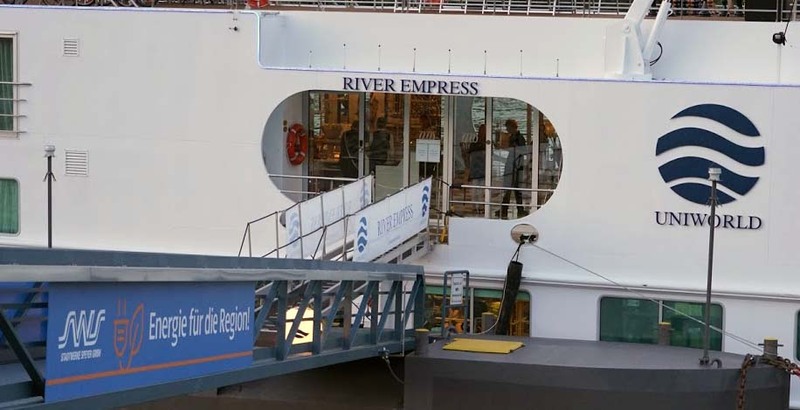 Our first pre-dinner encounter felt like a mixer, where there was a briefing by Captain Ferdy (Savelkuls), who’d grown up on the Rhine, the Hotel Manager Celina Sousa from Madeira, Portugal, and the Italian Cruise Manager, Damiano Olivieri. In addition, Chad Briggs was on the ship to help with the younger-generation programs. Each one of them outlined the destinations and what to expect that week. Champagne was passed by Sylvie and her team, which didn’t hurt at all. We were all set for an adventure. It was amazing how quickly the passengers got to know one another. The passengers acted the same way they probably did on their first day of college. Actually, probably more so, since 43 of the 111 guests were under the age of 21. The Captain’s Lounge had been converted to a multigenerational club with lots of games and movies and was put to good use. The Captain invited everyone to tour the bridge and learn about sailing the boat and navigating the locks. Numerous families sailed together, including one group of 17 and another of 11. Crew members expected the kids to be rowdy, but they were amazingly well behaved. What amazed me is that there were some no-children couples on the ship. I couldn’t imagine why they’d chosen a multi-generational cruise and was quick to ask why. They said the cruise was when they had time. Another couple said they loved the energy of sailing with three generations. Even though there was talk of having a 6 p.m. dinner service for the younger generation, that didn’t sell. Everyone ate at the same time; the Captain’s table was populated by the younger passengers and crew members. I loved that everyone dressed for dinner even though it was by no means formal. It was healthy farm-to-table and much better and certainly more copious than they needed to be. The breakfasts and lunches were buffets that offered so many choices that gourmets and gourmands were in heaven. At the more formal dinners, there were two choices for each course plus a vegetarian menu. If that didn’t appeal to diners, there was a default menu of salmon, steak and chicken. Lovely pastas were available for the children as well as the adults. Hotdogs and fried chicken were spotted at a couple of lunches. Vegetables and as much fresh fruit as anyone could want were on the buffet. If anyone was hungry between meals, fruit and cookies were available for the taking. Then there was the ice cream that our 14-year-old said was the best she’s ever eaten. 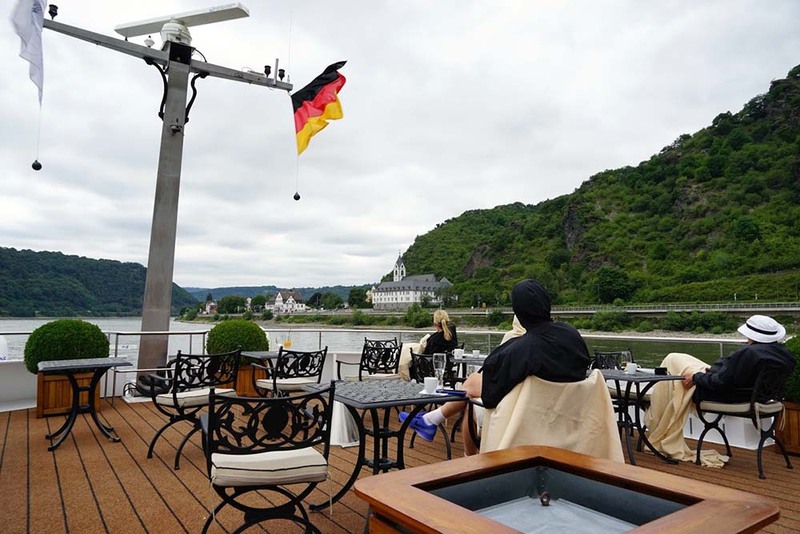 My 11-year-old granddaughter biked 17 miles between our overnight stop in Boppard (Germany) to the next day’s stop in Koblenz. While she was doing that, I participated in the early morning stretch class with the “well-being” coach. One could jog on the deck, although not before 8 a.m., since some guests might be sleeping. The late afternoons and evenings were pretty set. 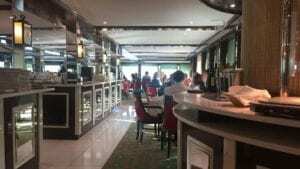 Tea was served in the lounge each afternoon and before dinner there was a presentation of the next day’s events with the cruise manager. Before dinner, Sylvie would tell us about the wines that were going to be served with dinner. At 9 p.m., there was entertainment in the lounge with performances including a jazz evening, a performance by a wonderful opera singer and an evening of dancing and more. But after that is when the real fun began. The teens connected with one another and danced to their hearts’ delight. As it turned out, Robert, the rather staid-looking pianist, who had an incredible repertoire of classics and show tunes, turned out to do down-and-dirty Elvis impersonations. Everyone was happy to twist and shout. And yes, three generations were frequently together on the dance floor. When we docked in Amsterdam, we felt as if we were leaving family. The crew members were nurturing and we were sad to leave. People have asked me whether the trip was worth the cost. The answer is an unequivocal yes. The five of us bonded as we never had before. Maybe it’s easier to feel like a family when there are no dishes to wash.